Today, on this auspicious Thursday, steady stream of devotees flowed in to Prasanthi Nilayam, as the gates were opened at 0800 hrs. in the morning, to have "Maha Samadhi" darshan of Beloved Bhagawan. Vedam and Bhajans have been rescheduled to original timings, i.e., Vedam from 0800 hrs. till 0900 hrs. and Bhajans till 0940 hrs. and in the evening, Vedam from 1630 hrs. for an hour and Bhajans from 1730 hrs. till 1815 hrs. Wed, April 27, 2011: On this first evening of Maha Samadhi of Beloved Bhagawan, there was a change in programme scheudule. One hour Vedam chanting began at 1600 hrs. followed by bhajans at 1700 hrs. to end with Mangala Arathi at 1800 hrs. As darshan of Maha Samadhi commenced this forenoon at 1145 hrs. a continuous stream of devotees are pouring in to have a precious glimpse of the Maha Samadhi in Sai Kulwant Hall. Many faces are writ with deep emotion and suppressed feeling burst open at the site of Maha Samadhi. At the end of Mangala Arathi, an announcement was made on the darshan schedule for the next two days. Darshan of Maha Samadhi, for tomorrow and the day after will commence at 0800 hrs. till 1200 hrs. and in the evening from 1600 hrs. till 2000 hrs. Puttaparthi that sung lullabies to infant Sathya, that fondled and nurtured Little Sathya to Sri Sathya Sai and that received the abundance of His love and care over and over again during the past eight and a half decade finally earned a day to grieve, though the day will be marked in the annals of Divine History as the most significant of the day, when Avatar of the age was laid to rest. ...This is definitely not of her choice, but as fate would have it, a grieving Puttaparthi had to accept this present as well, as she has been receiving over the past eight and a half decade, in abundance. It was a Divine Script that was written by Him alone and executed in His own inimitable fashion. For all the glory, happiness and bliss that she has received over and over again, when the final moment arrived, to bid farewell to the Soul of entire creation, she grieved and so were millions upon millions around the world. Bhagawan who left His mortal coil on the 24th April 2011 was laid to rest in Sai Kulwant Hall this morning in presence of a huge assemblage of devotees, also attended by a host of political luminaries. Earlier, the function commenced with an aalaap bhajan by noted classical vocalist Pt. Jasraj, that was followed by an hour-long bhajan by students. A host of prayers representing various religions, that included Jewish, Christianity, Islam, Buddhism and Sikhism followed before a set of selected bhajans, that were so dear to Beloved Bhagawan, was rendered by students bringing tears in the assemblage, taking one and all to nostalgic happy days with their Beloved "Swami". Yeddyurappa, Telugu Desam Supremo and former AP Chief Minister, Chandrababu Naidu, former Maharashtra Chief Minister Ashok Chavan, veteran VHP leader Ashok Singhal, AP Ministers Geeta Reddy, Raghuveera Reddy etc. The Divine Physical Frame that was draped in Bhagawan's favourite orange colour was lowered into the Samadhi amidst vedic chanting. In a symbolic gesture, the ceremony was marked with gifting of a cow and clothes (godhaana and buudhaana). Special water collected various holy rivers across India was also sprinkled on the Divine Frame sanctifying the occasion. As fragrant Vibhuti smell wafted in the air granting the nostalgia of golden days when Beloved spent time amidst on the same dais, and announcement came that darshan would commence at 11:45 hrs. As is the case in Shirdi, this Tomb of the Avatar of the Age would start speaking to His chosen devotees now on...and would be the solace for grieving devotees from around the world. Puttaparthi beckons, with much more intensity as our Beloved Lord Sri Sathya Sai would speak from His tomb from now on!!!
" The curtains were removed after 40 minutes for the people to have a glimpse of the ‘samadhi’ where the body was laid to rest in line with the practice adopted for Hindu spiritual saints. Normally, Hindus cremate their bodies. Governor Narasimhan, Chief Minister Reddy, Advani, Chandra Babu Naidu and other leaders went to the samadhi had a word with Ratnakar and sprinkled sacred ash at the spot. Earlier, a little before 9 a.m. the glass casket in which Sai Baba’s body was lying in state from Sunday night was removed and the body was wrapped in national tri colour for a brief while. Men of the Andhra Pradesh Armed Police sounded the last post and fired 21 shots in the air as a mark of respect. Then the tri colour was removed and verses from Hindu, Christian, Islamic, Sikh, Judaism and Buddhist scriptures were read out by leaders from these sects. Later, they joined in sprinkling the sacred ash at the samadhi spot as ‘mangal aarti’ was performed. With Sai Baba’s body draped in his favourite saffron robe, the last rites were performed by Mr. Ratnakar, who wept inconsolably, while priests recited vedic chants. Mr. Ratnakar Swami's Nephew & also a member of the Sri Sathya Sai Central Trust. Water from sacred rivers from all over the country were sprinkled on Sai Baba’s body along with ...honey, ghee and silk were given as gifts to priests. Nephew R. J. Ratnakar, seated center right in white, weeps as he performs the last rites for Bhagawan Sri Sathya Sai Baba at the Prasanthi Nilayam Ashram in Puttaparti, India, Wednesday, April 27, 2011. After the ceremony was over, Sai devotees gathered at the hall rushed to have a look at the Samadhi, which was open for public viewing after 11.45 a.m."
Prime Minister of India, along with scores of diginitaries, that included UPA Chairperson Sonia Gandhi, External Affairs Miniters, SM Krishna, Union Minister for Information and Broadcasting Ambika Soni, Governor and Chief Ministers of Andhra Pradesh, EVL Narasimhan and Kiran Kumar Reddy respectively flew down to Parthi to pay homage to Beloved Bhagawan. Arriving in a chartered flight from Delhi, the Prime Minister and his entourage arrived at the Sai Kulwant shortly after 1700 hrs. to spent ten minutes offering homage. He even chose to speak to senior Trust officials in Prasanthi Nilayam, Former Chief Justice PN Bhagvati and SV Giri, formerly Chief Election Commissioner of India. Other dignitaries visited Prasanthi this morning included Gujarat Chief Minister, Narendra Modi, Vishwa Hindu Pardishad leader Ashok Singhal, Swami Nityananda of Nithyananda Peetam, former Sri Lankan Cricketer Arjuna Ranatunga. As the clock ticks leading into the stipulated hour, before the final darshan possible this evening, there is palpable tension in Prasanthi with every heart and soul weeping within, embarcing the fate, geared up to give a final good-bye to The Lord of Parthi, her Beloved, Bhagawan Sri Sathya Sai Baba. 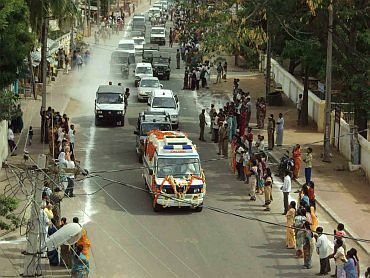 While the unending stream of devotees continue even at this declared final hour, unless an extension comes by, there is a security cordon in Puttaparthi this evening as Prime Minister of India, Manmohan Singh along with UPA chairperson Sonia Gandhi are expected anytime to pay homage to Beloved Bhagawan. The Prime Minister had visited Puttaparthi twice earlier, as Chief of Annual Convocation for the 69th Birthday followed by during the latest convocation, as recently as in November 2010 on the occasion of 85th Birthday of Beloved Bhagawan. It had been a case of rejoicement, great merriment for Parthi, over and over again, welcoming The Lord every morning and evening and even during His staying away at Bangalore or Kodaikanal, welcoming her Beloved back to her precincts, every time when He returned. It is indeed hard for this privileged land to bid fare-well to this most 'loving persona', Who lived a life sticking to His preaching. His Life has always been His Message and it is time for everyone who loves Him to follow the path shown by Him, and the legacy left behind by the Sri Sathy Sai Avatar. Lead Kindly Light, Oh! Beloved Lord! With Sai devotees continuing to surge into the Puttparthi to offer their homage to the Bhagawan Sri Sathya Sai Baba, authorities on Tuesday extended the final darshan timing till midnight. Inspector General (Rayalaseema Region) Santosh Mehra said the darshan timing, which was to end at 6.00 pm today, has been extended till about midnight. Prime Minister Manmohan Singh and UPA chairperson Sonia Gandhi and External Affairs Minister SM Krishna are among the VVIPs who are expected to visit the town - Puttparthi this evening to offer their tributes to Bhagawan Sri Sathya Sai Baba. Sri Sathya Sai Baba - Prasanthi News: In to the second day of the sudden jolt, after enduring the separation of Her Beloved in the physical sense, the township is gripped in sorrow as pall of gloom descended on Puttaparthi. Lakhs and lakhs of devotees are streaming into the Ashram, in unending lines, day and night, to have a priceless glimpse of The Lord who enthralled millions over millions during His earthly sojourn that spanned over eight and a half decade, with His Divine Darshan! Frenzy gripped the township with then unexpected turn of event, and Prasanthi Nilayam, that has been the cynosure of eyes for all the epochal spiritual happenings over the years, is once again in the limelight, this time for a different reason, the sudden departure of her Beloved Lord. Devotees wait to pay their last respects to Bhagawan Sri Sathya Sai Baba inside Prashanthi Nilayam at Puttaparthi village Thousands of grieving devotees on April 25 filed past the body of Bhagawan followed by politicians, Bollywood actors and sport stars alike. Devotees, some many with unshakable faith, ever hoping against the hope and not ready to accept the happening, some resigned to accept the happening and many more dwelling upon the glorious saga of Love Incarnate form a diversified feeling at the unexpected departure of Beloved Bhagawan. Regional, National and International Channels are camping in the township, capturing the events from Prasanthi Nilayam. Prime Minister Manmohan Singh in His condolence to the bereaved Sai fraternity described Bhagawan as a spiritual leader who inspired millions to lead a moral and meaningful life even as they followed the religion of their choice. "Sri Sathya Sai Baba as a preacher of the highest human values was an iconic figure for over five decades. He endeared himself to the people through various institutions, with headquarters at Prasanthi Nilayam, that promoted egalitarian values, education and public health," said the Prime Minister. Cricketing icons Sunil Gavaskar and Sachin Tendulkar joined the unending list of dignitaries paying obeisance to Bhagawan. As per the announcement made on Sunday, Bhagawan's physical frame would lie in state until Wednesday morning. in a glass case, in a procession led by Vedic chanting and bhajans by students of Sri Sathya Sai Institute of Higher Learning. With Bhagawan’s physical frame lying in state for the next two days, bhajans will continue throughout, as thousands upon thousands are expected to flock into the township to have the darshan of their Beloved “Swami”. State Governor and Chief Minister of Andhra Pradesh air-dashed to Parthi after hearing the news of Bhagawan’s passing away. Many other prominent figures have also joined in, offering condolences at the grave happening. Bhagawan Baba's Body will lie in state at Sai Kulwant Hall for two days (Monday and Tuesday). Arrangements will be made for Darshan after 1800 hrs. today, at Sai Kulwant Hall. As the news spread, thousands upon thousands are flocking into the Prasnathi Nilayam to have the darshan of Bhagawan Sri Sathya Sai Baba. This includes commoners to celebrities to government dignitaries. As per the announcement, Bhagawan’s physical frame would be lying in state for two days, Monday and Tuesday, allowing devotees to have darshan of Bhagawan. The Divine Body was taken out of the hospital after 1400 hrs., brought to The Divine Abode, Yajur Mandiram at 1425 hrs. Bhagawan Sri Sathya Sai Baba continues to be in a very critical condition of health on the 27th day of His treatment in this hospital. He is still breathing with ventilator support. The episodes of low blood pressure are still a cause of great worry to the doctors treating Him. Bhagawan Baba continues to be under constant attention of the panel of doctors attending upon Him. Bhagawan Sri Sathya Sai Baba continues to be in the same critical condition as yesterday. He continues to be very critical. He is still on ventilator support. A cycle of slow haemodialysis has been completed on Him this morning. He continues to be under close scrutiny and round the clock treatment by the panel of doctors attending upon Him. >>> More News: Sri Sathya Sai Baba's health updates. "Police have also erected barricades on all the roads leading to the town and are checking every vehicle entering the town.According to police sources, five layers of security have been thrown around the town to prevent any incident.Police have also beefed up security around the airport, railway and bus stations and other installations in the town. Senior police officials from all parts of Rayalaseema are rushing to Puttaparthi. Anantapur range Deputy Inspector General of Police Charu Sinha and Anantapur Superintendent of Police Shahnawaz Qasim are camping in the town and supervising the security arrangements." Bhagawan Sri Sathya Sai Baba continues in the same clinical condition as He was in the morning. There is no sign of change in His health condition. He continues to be in the same critical state of health. He is still supported by ventilator and is on CRRT system of dialysis. His blood pressure and heart rate have been stable for the last 12 hours and are supported by necessary drugs. The panel of doctors treating Him is keeping a close watch on His health. Bhagawan Sri Sathya Sai Baba still continues to be in a very critical state of health. His respiration is supported by ventilator. He is put on CRRT system of dialysis to assist the functioning of the kidneys. The response shown to the treatment continues to be minimal by all the vital organs. His heart rate and blood pressure continue to be low and they are supported by drugs. There is no significant change in the overall clinical condition since yesterday. The doctors, however, are continuing their vigorous, round the clock treatment. Fri, Mar 25, 2011: Prasanthi scripted a beautiful darshan story this evening with Bhagawan emerged at 1915 hrs. coming for two full rounds of darshan. After completing the first round Bhagawan moved into the ladies' side and continued with a bonus round of darshan. Primary School children had a wonderful time with Bhagawan, as Bhagawan preferred to stop at the block for a while during the end of His first round. The little children literally swarmed around His car with greetings in their hands. One after one, each one of them sought blessings from Bhagawan before His car moved into the ladies' side, granting the bonus round of darshan. A group from Alike, Muddenahalli institutions also received Bhagawan's special attention during the round of darshan. Coming on stage at 1930 hrs. Bhagawan sat for the next half-an-hour and bhajans turned intense. With Bhagawan joining, giving finger beats in between, the session turned out to be a delectable bhajan treat for the august assembly in the twilight. Just two minutes short of 2000 hrs. Bhagawan asked for Mangala Arathi. Even as Arathi was coming to an end, Bhagawan turned into a blessing mood, blessing the audience with double hand abhayahastha, continuously. Post Arathi, before leaving the dais, once again His blessing right palm went up, blessing the audience with abhayahastha. Bhagawan left for Yajur Mandiram at 2005 hrs. Wed, Mar 23, 2011: This evening Bhagawan emerged at 1850 hrs. and headed into the Poornachandra Auditorium. Outgoing batch of Sevadals, an all India batch, was seated in the auditorium for special blessings. Coming on to the special dais, Bhagawan blessed the prasadam for distribution. Even as prasadam went for distribution, Bhagawan moved down for His usual blessings rounds. After completing the rounds, both ladies and gents, spending more than twenty minutes, Bhagawan moved off, setting off to Sai Kulwant, not before accepting Mangala Arathi by the group. The Sai Kulwant 'saga' commenced at 1915 hrs. with Bhagawan's arrival amidst bhajans. A usual round of darshan followed before Bhagawan appeared on the dais. At the end of His darshan round, after crossing the Vedam block, Bhagawan went for a deep turn, moving closer to the children from Easwaramma English Medium School, before coming on to the verandah. Even as He came on to the dais, Bhagawan beckoned one of the faculty members to bless him, accepting his letter. Editor, Sanathana Sarathi - Telugu followed, seeking blessing for the latest issue of the magazine. Subsequently, Bhagawan completed a round of Ganesh to come back on the dais at 1930 hrs. Some students in the front row were having a greeting for Bhagawan. Bhagawan signalled and a couple of them came along with a big and beautiful card done with artistry. Bhagawan had a detailed look followed by comments on the same. Subsequently Bhagawan blessed the boys with padanamaskar. A couple of bhajans and it was time for Mangala Arathi. With the Arathi song on, Bhagawan's blessing palm went up in 'abhayahastha'. After Arathi, once again blessing the audience with abhayahastha, Bhagawan moved off, retiring to Yajur Mandiram at 1945 hrs. Mon, Mar 21, 2011: Everything with Beloved Bhagawan is sweet and beautiful. This evening's darshan was short, yet supremely beautiful. Bhagawan came in, 'quite early', at 1835 hrs., showing up on the stage in next five minutes. Officiating the session for two full bhajans Bhagawan indicated for Mangala Arathi and left the dais, blessing the concourse, retiring to Yajur Mandiram at 1850 hrs. Sun, Mar 20, 2011: Heightened tempo in bhajans coupled with an escalated feeling marked the arrival of Bhagawan at 1925 hrs. this evening in this Abode of Supreme Peace in Prasanthi Nilayam. ...And as He moved showing His compassionate face, showering love all over, thousands filled the Sai Kulwant turned ecstatic, raining bliss within. Holilday crowd ensured a packed audience and a festive Holi feeling was hanging very much in the air especially with a distinct group of men and women from the state of Bihar. As His car inched along, it appeared there were many stakeholders in the evening at the ladies' side. His car moved at snail's pace, often stopping in between, and Bhagawan went on attending to many pleadings. Devotees' frenzy peaked as He went for a second round. Many at the back stood on their feet to have a precious glance and when they screamed the sound melted with the loud bhajans. Stopping at the Vedam block Bhagawan blessed one of the students with interactions and, felicitating the whisperings, bhajans were muted for sometime. During the rounds, His hands went on spraying Vibhuti packets after every next point throughout His lengthy darshan round that took 25 minutes. The twin rounds were over and Bhagawan was on the stage soon. Birthday boys were ready for The Lord and Bhagawan beckoned them. He blessed all of them including a bunch of tiny tots from Primary School spraying yellow rice grains. A couple of boys had some creative offerings for Bhagawan. Bhagawan blessed them, taking time going through same. His motherly love was exhibited here as He stroked at their cheeks, a sign of His all conquering love for His children. To one of the boys, who had a colour painting of Revered Mother Easwaramma, Bhagawan had some valid suggestions about the painting, before blessing him, gesturing with a 'chaala santosham'. Bhagawan sat on as bhajans continued. In between Bhagawan sprinkled some of the yellow rice grains, that remained left on His lap, twice. It was time for prasadam. As boys went unto Him with Laddu Parasadam seeking blessing, Bhagawan collected a few, one after one, giving the prasadam in person to some of the frontbenchers. At 2020 hrs. Bhagawan indicated for Mangala Arathi. Blessing the concourse, expressing His satisfaction with a blossoming smile, Bhagawan left the dais and retired to Yajur Mandiram at 2025 hrs. Sai Kulwant was ecstatic reminscing the golden moments of the evening and so were the thousands filled in the blessed 'Divine Theatre' where God chose to 'walk', conferring His highest benedictions. Fri, Mar 18, 2011: This beautiful Friday evening's appointment with The Lord began at the twilight hour at 1900 when Bhagawan emerged from His Divine Abode Yajur Mandiram. A full round of darshan ensued before Bhagawan alighting on the verandah in ten minutes. A group of veteran leaders belonging to the RSS (Rashtriya Swayam Sevak Sangh) led by veteran VHP leader Ashok Singhal welcomed Bhagawan as He alighted from His car. A group of over 50, including some women, belonging to all India and Regional Cadre of RSS and allied organisations, known as 'Adhikaris' was seated in the Bhajan Hall. The group was on a pilgrimage to The Divine Abode, as termed "Puttaparthi Pravas". Prominent members in the group included RSS Chief, Sri Mohanji Bhagavat, Former Chief Sri KK Sudarshan, General Secretary Suresh Joshi, Joint General Secretaries Sri Suresh Soni and Sri Datta Hosabale. Bhagawan moved into the hall and spent next fifteen minutes in. As Sri Ashok Singhal briefed, introducing the prominent faces in the group, Bhagawan sat listening to the veteran leader before moving amongst, blessing the group with closer darshan. Coming out from the main entrance, Bhagawan blessed a few devotees before inching along though the lower verandah blessing many, including officials from Sri Sathya Sai Seva Organisations, Bihar, who had a prayer at His Feet to have Holi celebrations on the next day. Coming on stage at 1930 hrs. Bhagawan blessed the audience for the next ten minutes with His Divine Presence on the stage. Even as He assumed His seat on the dais, gents from the the special group of over fifty came out of the hall to occupy the specially reserved slots on the right of Bhagawan. At 1940 hrs. Bhagawan indicated for Mangala Arathi. After Arathi, blessing the audience, Bhagawan left the dais and retired to Yajur Mandiram at at 1945 hrs. Wed, Mar 16, 2011: This evening Bhagawan arrived amidst bhajans, at 1920 hrs. and went for His usual round. Following the previous evening's pattern, Bhagawan completed the day's rounds with another half round, with the women devotees going lucky once again. Month of March is meant for Gratitude Programmes by grateful students who are passing out of the hallowed portals of Sathya Sai Institutions. This is one occasion when students pour their grateful feelings out, as an offering to Bhagawan. Often, every passing out batch produces creative multimedia presentations packaging their love and gratitude for Bhagawan. Today's frontbencher's had such a collection of presentations for Bhagawan. Bhagawan went through the contents, before blessing the children and their 'creativity'. Another student, a bhajan singer, who had a letter for Bhagawan earned His attention and Bhagawan lovingly 'interacted' with the boy by way of reading his letter, out in open. A few seconds of pause and it was pin drop silence all over. His blessed palm went up in Abhayahastha and devotees responded with loud applause. Bhagawan indicated that it was time to move. Once again the crowd burst into applause, a regular affair during Prasanthi evenings these days. He took a right turn to come on to the lower verandah, inching along towards the car to retire to Yajur Mandiram at 2000 hrs. Tue, Mar 15, 2011: Today was Sevadal blessing day. Completing their weeklong service in the Ashram, second and final batch of Sevadals from Maharashtra assembled this evening in the Poornachandra for special blessings. Bhagawan came in at 1855 hrs. and soon ascended the special dais, down the main stage. Shortly after, after blessing Prasadam for distribution, Bhagawan came down the dais to move in the centre-pathway. Inching along, Bhagawan gave closer darshan to the enthusiastic, devoted hundreds by completing two separate rounds of ladies' and gents' wing. It was time for Mangala Arathi. After Arathi, Bhagawan moved up the Poornachandra stage, en route Sai Kulwant Hall. Bhajans were on in full swing and Bhagawan completed His usual round before going for a half round, covering ladies' side, landing on the Verandah. Arriving on stage, Bhagawan sat till 1935 hrs. when He indicated for Mangala Arathi. In the meanwhile, Maharashtra sevadals had been filing into the hall, utilizing a precious opportunity for a second round of darshan. Blessing the concourse Bhagawan retired to Yajur Mandiram at 1940 hrs. Blessed laddu prasadam was distributed to the entire audience. Sun, Mar 13, 2011: Mother Sai was proud and He decided to felicitate His students for their stupendous achievements! There was a small intermission during the bhajans this evening when a dozen students were felicitated by Bhagawan for academic excellence at the national level. Eleven students from SSSIHL have been cleared for Junior Research Fellowship by CSIR, Council of Scientific Industrial Research, after coming out with flying colours in the national level eligibility test conducted by UGC, University Grants Commission. These students belonged to the departments of Physics, Chemistry and Bio-Science. Another student who has cleared NET, National Eligibility Test, for MBAs was also felicitated. As Prof. Anil Kumar called out their names, these students came on stage one after one to receive the 'priceless' gift from the Divine Chancellor. Bhajans continued for some more time, until 1910 hrs. when Bhagawan indicated for Mangala Arathi. Blessing the assembly, Bhagawan retired to Yajur Mandiram at 1915 hrs. Blessed prasadam was distributed to the entire audience. Sat, Mar 12, 2011: "So Are We Bound; So Are We Free" was the big artistic writing on a symbolic kite banner that adorned the Poornachandra backdrop this evening, as eighty six students from the 2003 batch of SSSIHL assembled at the venue along with their immediate families, in anticipation of yet another "Bond of Love" with Bhagawan. Quite innovative and distinct from the previous episodes of "Prema Bandham", this 2003 batch had a unique theme, "So Are We Bound; So Are We Free", meaning their bond with Bhagawan that brings freedom. Bhagawan arrived at 1910 hrs. to a grand Poornakumbha reception along with Vedam chanting. As He came down the dais, Bhagawan was welcomed by a group comprising of mothers and betterhalves of the alumni, holding trays with flowers and lighted lamps. A cake was blessed commemorating the occasion before Bhagawan assuming the special dais. Even as Bhagawan came on to the dais a programme card was brought to Him praying for Divine approval. Bhagawan blessed the same and there began a mini music programme comprising three songs. At the end of the song session, Bhagawan came down the dais to move in the lanes between the rows blessing the special assembly with closer darshan and padanamaskar. Safari pieces and sarees, blessed by Bhagawan were distributed to the assembly. After accepting Mangala Arathi Bhagawan moved off, heading towards Yajur Mandiram. From Poornachandra to Sai Kulwant. Bhagawan was soon in the Sai Kulwant at 1940 hrs., amidst bhajans. After the usual full round of darshan Bhagawan came on the dais. As bhajans continued, Bhagawan sat for the next half-an-hour before calling for Mangala Arathi. Blessing one of the bhajan singers with Divine Whisperings, blessing the assemby with abhayahastha, Bhagawan retired to Yajur Mandiram at 2010 hrs. Blessed prasadam was distributed to the entire assembly. Thu, Mar 10, 2011: This forenoon, at around 1130 hrs., Bhagawan emerged from Yajur Mandiram driving beyond the gates for a round of the township. Bhagawan returned to the Ashram in an hour time, through the western gate of Prasanthi Nilayam. When Bhagawan is the Force and Source, a day in Prasanthi Nilayam is defined by 'His Moves'. The day when He comes out with a blooming smile, spend ample time around, is 'the day' in every one's imagination. On this Holy Thursday evening, after an initial buzz just after 6 o' clock, Bhagawan arrived at 1840 hrs. going for a usual round. Unlike other days, there were intermissions, with Bhagawan stopping to interact and bless in between. A visiting group of devotees from 'Anakapalle-Vijayawada' also got His attention as Bhagawan chose to stop at the gents' side to listen to this group members. After completing the round, as is His wont, Bhagawan moved into the ladies' side. To everyone's pleasant surprise, He went further, this time going for a bonus round! After this second round, Bhagawan returned to verandah from the aisle at the gents' side. The 'Anakapalle - Vijayawada' group in blue got His attention once again during the bonus round. Even as He got down from the car, a group of boys belonging to the 2003 batch was awaiting seeking approval for "Prema Bandham" during this weekend. Bhagawan blessed the boys before moving in to the bhajan hall. After spending sometime around, talking to some, Bhagawan glide past the bhajan hall, exiting through the rear entrance. He chose to spent a while listening to two seniors, Prof. Anil Kumar and Prof. Veerabhadraiah, Telugu Editor of Sanathana Sarathi, before coming on stage. His brief tenure on the stage evoked greater interest as Bhagawan showed keen interest to interact with boys. One of the lead pair of bhajan singers was called unto Him and Bhagawan freely interacted with the duo for some time. One of these boys had a black colour rosary which Bhagawan blessed and helped Himself, adorning the same on the boy's neck. Lovingly Bhagawan stroked at the cheeks of the boys and the duo, with utmost humility, stood before The Lord receiving His bounty. Another boy who was having a big colour painting of Lord Subramanya, a painting by him, was beckoned by Bhagawan. Bhagawan had a detailed look at the painting before passing some comments. Even as He was blessing the boy with the painting, Bhagawan indicated for Mangala Arathi, at 1930 hrs. After Arathi as the 'Jaikar invite' rang in the air aloud, Bhagawan gestured at the boy, raising His hands to His ears, as if indicating, 'loud piercing sound'. Everyone had a hearty laugh at His gesture. In the brief pause that ensued, His blessed open palm moved up, waving in circular, followed by the Divine Act of scribbling in the air. He scribbled once again before indicating to leave. The Lord leaves no prayer unanswered. Even as He took the turn to retire, He stopped for a while beckoning one of the Vedam boys, who was holding a letter. Calling the boy on to the dais Bhagawan interacted with Him for a while before showering His bounteous blessing. A brief interaction with one of the photographers followed. It was time for Bhagawan to retire. Bhagawan retired to Yajur Mandiram, at 1940 hrs. With Shivarathri over and the month of March is advancing, early winds of summer is blowing in the township showing signs of yet another summer season. Though the mercury has just crossed the mid thirties, nevertheless it is a definite indication of a peaking summer ahead. Wed, Mar 9, 2011: This evening Bhagawan arrived at 1910 hrs. After a full round of darshan Bhagawan came on to the dais and presided over the session till Mangala Arathi at 1940 hrs. The half-an-hour of Bhagawan's presence on the stage was marked by high pitch bhajans. With a thousand throat singing the Universal Prayer, marking the conclusion of the session, Bhagawan as well joined for a moment, with His hand gestures striking chord with the beat, raising and dropping His palm in slow motion. Bhagawan retired to Yajur Mandiram at 1945 hrs. Tue, Mar 8, 2011: This evening turned out to be a wonderful one with Bhagawan spending ample time outside, conferring blessing to one and all. Today was yet another Sevadal blessing day. The outgoing Maharashtra batch of Sevadals were seated in the Poornachandra Auditorium, this evening, seeking special blessings. Bhagawan came into the auditorium at 1837 hrs. Even as He assumed the special dais, down the main stage, prasadam for distribution were taken to Him, both by ladies and gents separately. After blessing the same Bhagawan came down the dais, this time to move on the centre pathway that divides ladies and gents. Excited bunch of Sevadals converged at the periphery; Bhagawan inched along, blessing one and all with His loving glance falling upon the 'convergence'. A bigger round was in the offing! From the centre-line, Bhagawan moved on to the right, setting off for a bigger round, this time, covering the entire assembly of Sevadals. Completing this round, even as Bhagawan was preparing to leave, group representative offered Mangala Arathi. In the meantime, 'a lucky few' got to interact with Bhagawan. At 1852 hrs. Bhagawan climbed on to the dais, moving into the Poornachandra backstage. Blessed prasadam was distributed to the entire batch. ....And even as the session was coming to a close, bliss of His greater love and compassion was raining in many a heart and the Sevadals left the auditorium with their faces lit up and hearts full. Taking a second chance, many a lady sevadal later filed into the Sai Kulwant as well. The storyline shifts to the bigger venue, the Sai Kulwant Hall. Showing up on the dais after His usual round, Bhagawan sat for a long seventy minutes with bhajans filling the precincts of Prasanthi Nilayam. After a quiet 'first-half', boys made the best of the given opportunity! A seemingly unending bunch of students, all with a single agenda of receiving His blessings, made a 'beeline' unto the dais. With hands stretched out, humility writ large on their faces, some with blooming smiles adorning their faces, one after one as they 'hopped', approaching the dais, it was the Lord of greater compassion who received these lovely children with atmost patience and love! Bhagawan attended to each and every one of them, as if the evening was earmarked exclusively for these children. Some sought birthday blessings and Bhagawan reciprocated with sprinkling yellow grains; some others sought project blessings and Bhagawan with atmost patience and curiosity browsed through the pages of record books, often listening to their explanations. Someone else had a bunch of letters, apparently from an outgoing batch of students who are writing board exams. Bhagawan was very much at their beck and call, blessing them all with His bounty. For the assembly of devotees, this was indeed a greater blessing producing a productive longer spell of Divine Darshan! Even after the 'session' Bhagawan sat for a couple of more bhajans before He chose to move into the Interview Room for a brief pause. Emerging in five minutes, Bhagawan accepted Mangala Arathi. As the Arathi song went on reverberating the hall, Bhagawan boarded the car, returning to Yajur Mandiram, ending a beautiful blessed evening in Prasanthi Nilayam. "Subramanyam...Subramanyam...", the bhajan that would mark the end of bhajan session during earlier days, at 1935 hrs. During the pause of silence that followed after the Arathi, Bhagawan gestured with His hands, as if conveying 'okay, to the students before leaving the dais. Bhagawan retired to Yajur Mandiram at 1940 hrs. Sun, Mar 6, 2011: When thousands joined together singing and invoking, keeping their hopes vibrant, this Sunday evening turned alive hosting yet another Divine Darshan! Bhagawan arrived at 1925 hrs. amidst bhajans. A full round of darshan ensued and soon Bhagawan was on the dais. As Bhagawan sat on presiding over the session, a capacity audience once again joined in merriment, with booming chorus. Bhajans continued for the next half-an-hour. At 1955 hrs. Bhagawan asked for Mangala Arathi. He blessed the concourse, students, gents and ladies separate with Abhayahastha. Leaving the dais Bhagawan took a right turn, to come on to the lower portico, where many alert hands were ready awaiting a chance. Bhagawan accepted letters from many, conversed with some others before retiring to Yajur Mandiram at 2005 hrs. Blessed prasadam was distributed to the entire assemblage. Sat, Mar 5, 2011: This evening turned out to be a welcome change with Bhagawan emerging at 1800 hrs. giving a pleasant surprise. Arriving on stage after a full round of darshan, Bhagawan presided over the session for the next more than half-an-hour with bhajans rendered by students filling the air in Prasanthi. Bhagawan sat through keenly observing the assembly and devotees rejoiced every moment of this greater boon, enthusiastically following the bhajas in full throat. At 1840 hrs. Bhagawan turned to the priest indicating for Mangala Arathi. Fri, Mar 4, 2011: Bhagawan went for a round of Prasanthi Township today, in the forenoon. Emerging at around 1120 hrs. Bhagawan moved along the road, crossing Yenumanappali Cross, leading to the Super Specialty Hospital. Taking a detour from the petrol bunk, Bhagawan returned to the Ashram at 12 noon, via the western gate. Hundreds lined up en route, inside the Ashram, for a glimpse of The Lord. Bhagawan, in His outpouring love and compassion, went on blessing the devotees with Abhayahastha. 'Sweeter and sweeter as the days go by' is perhaps the right expression to describe Divine Darshan in Prasanthi Nilayam. At a time when Darshan sessions are becoming shorter and shorter, one can find an increasing awareness among the public of the greater importance of Divine Darshan! ...And with this increasing awareness, thousands upon thousands are flocking into this Valley of Peace every day, to catch a precious glimpse of The Lord! This Friday evening passed by presenting a such a short yet sweet darshan session. Bhagawan arrived at 1945 hrs. in His car, coming for usual round of darshan; towards the end of the round, He spent awhile with the 'Alike Team' of teachers and students. Alighting at the verandah, Bhagawan came on stage to preside over the session for the next fifteen minutes. Detached was His demenour all through, yet He was at His amusing best! As some boys approached Him with laddu prasadam for blessings before distribution, Bhagawan grabbed a few from the box to toss them unto some lucky boys. Accepting a letter from one of the boys, Bhagawan read through the same after blessing the boy with Padanamaskar. Bhajans went into higher gear as boys sang with great passion and devotional fervour; pubic responded erupting with booming chorus. It was time to wind up. At 2010 hrs. Bhagawan indicated for Mangala Arathi and soon, upon Arathi, Bhagawan left the dais, not before blessing the concourse with Abhayahastha. Bhagawan retired to Yajur Mandiram at 2015 hrs. Thu, Mar 3, 2011: With the thousands assembled in the Sai Kulwant kept awaiting the auspicious sight of The Lord, time ticked past and bhajans prolonged with devotional intensity, this morning in Prasanthi Nilayam. Rewarding the night long penance, Bhagawan arrived just after 0900 hrs. in the morning, out in the open, much to loud cheers from devotees. A quick round of darshan followed before Bhagawan arrived on stage. Bhajans continued till 0930 hrs. until Bhagawan indicated for Mangala Arathi. Special Prasadam was ready and the 'White Army' of students swung into action. As blessed prasadam, tamarind rice and sweet pudding, went for distribution, Bhagawan sat on for the next ten minutes watching over the proceedings. At 0940 Bhagawan moved off, retiring for the morning session. Earlier, before coming into the Sai Kulwant, Bhagawan headed towards Poornachandra Auditorium where thousands had assembled awaiting Divine Darshan. Wed, Mar 2, 2011: Maha Shivarathri Akhanda Bhajan 2011 commenced at 1850 hrs. in the immediate Divine Presence of Bhagawan, this evening in Prasanthi Nilayam. Tonight is Maha Shivarathri, the night dedicated to Lord Shiva. To the thousands assembled in Sai Kulwant who has been eagerly looking forward for Divine Darshan, it turned out to be a moment of bliss when Bhagawan presented Himself much early, at 1815 hrs., this evening. Sonorous Vedic chants, that has been on from 1630 hrs., coupled with some soulful Nadaswaram tunes by students welcomed The Lord as He emerged in. Bhagawan's car inched along and devotees, packed to capacity, had their share of excitement; many rose on to their feet and waved their hands greeting Bhagawan. Completing a round of blessing Bhagawan came on to the verandah. Special cake on the occasion, done by devotees from Italy, was ready for blessing. Bhagawan cut the cake and then moved along the lower verandah to come on to the dais. Vedic chanting continued until 1850 hrs. when Bhagawan nodded for the Akhanda Bhajans to commence. Boys and girls sang alternatively rendering many Shiva bhajans creating an air of greater devotional ambience. At 1915 hrs. Bhagawan moved off the dais to board His car. The car moved along the gents' side, with a reverse round, taking The Lord back to Yajur Mandiram at 1925 hrs. Earlier before coming into the Sai Kulwant Hall, Bhagawan, upon emerging from Yajur Mandiram headed towards Poornachandra Auditorium where thousands have assembled for Divine Darshan. Spending awhile there Bhagawan blessed the audience before returning. Tue, Mar 1, 2011: Maha Shivarathri is just a day away and on this preceding evening Prasanthi has been echoing the spiritual ambience of the holy occasion. Bhagawan arrived at 1920 hrs. to cheerful greetings from the jampacked audience, filled every inch of space in Sai Kulwant. Coming on stage after His usual round of blessings, Bhagawan presided over the bhajan session for the next ten mintues. In the meanwhile, a couple of boys received His special blessings. Ten minutes through the 'session' Bhagawan indicated for Mangala Arathi. Blessing the concourse with Abhayahastha Bhagawan moved off the dais into the Interview Room for a brief pause, before retiring to Yajur Mandiram at 1945 hrs. Prasadam was dsitributed after the offering of Mangala Arathi. With twilight bhajans, that has been the order of the day, serving feelers of the great holy night dedicated to Lord Shiva, Prasanthi is gearing up for the holy occasion scheduled for tomorrow. Ambience around is full of verve in anticipation of the holy night. Students from Brindavan and Anantapur campus have joined Prasanthi Nilayam to celebrate the occasion in the Holy Presence of their Beloved Swami.